Kefir is said to support the immune system and cleanse the digestive system. It is an excellent detoxer and balancer. Chuckling Goat, goats milk kefir is made with a base of fresh pasteurised goats milk, and fermented with living kefir “grains’ in the traditional style. This produces a kefir that is superior to kefirs which are made with powdered sachet starters. Live kefir continues to work inside the bottle, becoming stronger in taste and separating into curds and whey over time. THIS IS HOW YOU KNOW YOUR KEFIR IS REAL, LIVE AND ACTIVE! Simply shake or blend to resolve any lumps, grains or separation. 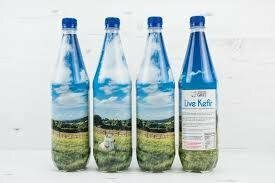 Chuckling Goat kefir is superior to “supermarket kefir” because it is live, unpasteurised, and continues to ferment inside the bottle, producing increasing numbers of live cultures over time. It is pure and unflavoured, without any harmful sweeteners, chemicals or additives. All kefir is not created equal! The kefir grains have been tested by Aberystwyth University, and are the real secret to its success. It is not recommend that you consume kefir if you are taking blood thinners or immunosuppressants.